There is not really a hockey skate that is better than all others because there is going to be a different “best skate” for each player. We looked at a variety of the most popular hockey skates on the market and considered them for materials used in construction, durability, ankle support and stiffness, padding and protection capability, workmanship, brand name reputation and customer comments. The three pairs of hockey skates reviewed below were winners in all of the categories we considered. One of these choices might be what you are looking for. There are many factors that go into the best hockey skate for your needs. Things like the width of your foot, your ability, skill level, style of playing, and weight. We will help you decide which type of hockey skate is best for your needs. What you will be doing with your hockey skates is an important piece of information when it comes to choosing the right ones. If you’re just playing recreationally and only go out to skate once in a while, purchasing a less expensive pair will work just fine. If you play on a team, you will want to look for the best hockey skates you can get for the budget you have. Even if you are a beginning hockey player or have a new interest in learning, it is always better to buy a more expensive pair of skates. This is beneficial because you won’t have to purchase another better pair of hockey skates after you have been playing for a while. These hockey skates are one of the top of the line hockey skates that are perfect for competitive play as well as recreational play. They are created to be efficient and powerful and they include a lot of the company’s technologies and designs. Features include a fit that accommodates many different foot sizes and types so they are comfortable as soon as you unpack them. 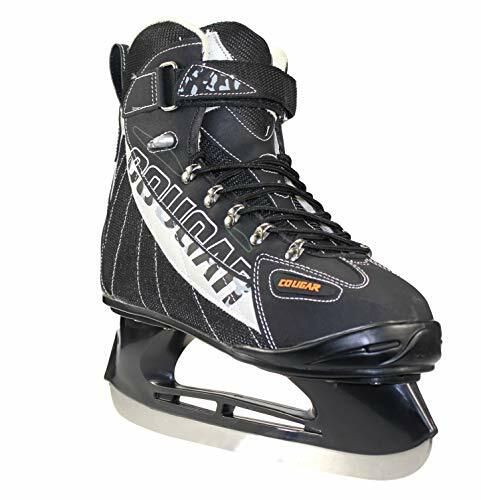 The fit of these hockey skates is very good for the beginning skater and will not need much in the way of breaking in. They feature an anatomical heel and ankle support that provides plenty of heel stability. Features also include Tuuk runners made of stainless steel and the Lightspeed pro-blade holder as well. The tongue is form fitting, made from 30 ounces of felt and there is a lightweight microfiber liner as well. This high quality well made hockey skate is a great choice for those who are just getting into hockey either for play or competitive means. If you are looking for a casual, easy going hockey skate for recreational skating with the family this is one that has plenty of it. 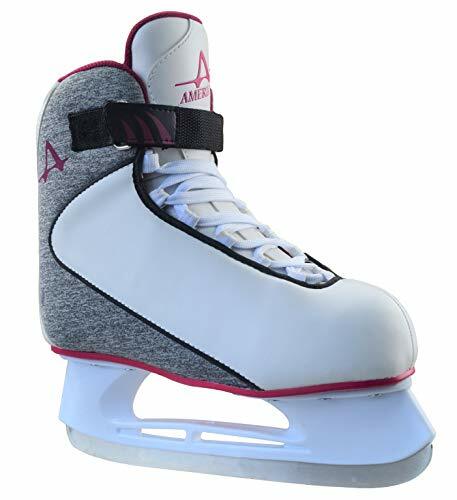 Features of the American Athletic Senior Cougar hockey skate include lots of foam padding for ultimate comfort and warmth, quick lacing with the lace loops, added support in the form of a Velcro strap, a steel runner of carbon. And a boot construction that is stable and sound due to the multi-layered design. These boots are easy to put on thanks to the pull on tab at the heel. Sizing runs true so finding the right size for your needs won’t be a problem. There is a lot to like about these hockey skates so if your family loves to get out on the ice and play and have fun, you will love how these skates fit and help you skate comfortably. American Athletic has gone above and beyond with this women’s hockey skate that features a soft boot in an attractive plum color. The sleek and stylish look of these hockey skates appeal to players of all skill levels. Construction consists of lots of comfortable foam padding for the maximum comfort, a speed-lacing feature with a fiber lining, hockey runner blades made of steel and ankle support that provides plenty of stability. The hockey skates by American Athletic are true to size so you can easily find the right size to fit your needs using their sizing chart. They do not follow the traditional US shoe sizing numbers. The stylish design on the boot adds a fashionable element to your look. This skate is versatile enough to work for moms and hockey lovers alike. If you are looking for a hockey skate that provides warmth, comfort, fashion and support, this is definitely one to take a serious look at. One of the most important decisions to make when you are purchasing hockey equipment is deciding on the right pair of hockey skates. Higher quality, better made skates will enhance the performance and style of each player, as well as taking care of their specific needs. This is based upon their skill level and the shape of their foot as well. The three top rated hockey skates featured above all above well made skates that work for a variety of playing styles and players. Whether the player skates for fun or competition, these skates will support their ankles well and provide what they need to have a comfortable fit that doesn’t get in the way of their game. Read more about choosing the right hockey skate in our buyer’s guide located below. We have provided you with some valuable information that will help you make the right decision when it comes to the right hockey skate f or you or the person you are buying for. There is a lot of advanced technology that goes into creating a hockey skate. 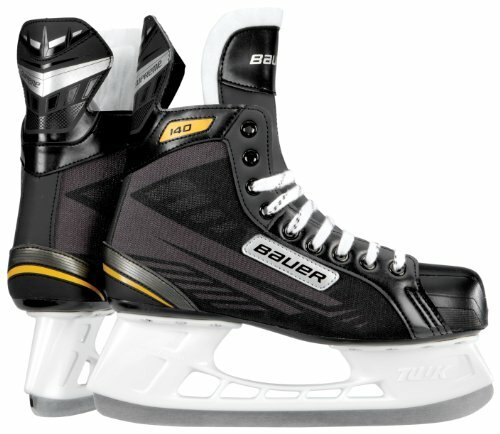 Companies are always looking for ways to improve their products and provide more support and more sensitive responses in their hockey skates Depending on the company, the boots of a hockey skate can be made from materials such as carbon composite, thermo-formable foam, texalium glass, hydrophobic lining that is anti-microbial. Factors such as comfort, weight, protection and durability are all part of what makes up the quality level of a hockey skate boot. Highly superior hockey skates have some key features that make them elite. A hockey skate boot is made up of many components. We have listed them below. Ankle padding – the ankle padding of a hockey skate is made up of foam that is inside the shell of the boot. Quarter Package – Another name for the boot shell that supports any inserts that are used and that holds the padding is quarter package. Support for the Heel – This is a pocket that is anatomically formed into the portion of the skate that is called the quarter package. Tongue – This is coverage that protects the front of the foot and ankle. It is usually one piece of felt or some other comfortable material. Outsole – The outsole is a rigid part of the boot that is located underneath the skate. It is where the runners are mounted. Footbed – The bottom of the boot, on the inside, has an insert that is padded and comfortable. It can be removed from the inside of the boot. It is to help keep your foot comfortable. Liner – The liner of a skate boot is often made of microfiber and is designed to keep your feet very comfortable while skating. Just because the brand name is well known, that doesn’t mean the skate is automatically the right one for you. Most manufacturers create many different types of skates to cover the many skating levels and physical sizes in need of a good hockey skate. High end models cost more and are much stiffer than others. The fit of your hockey skates is very important. Ill fitting skates can affect your performance and enjoyment when playing. Normally you should expect the hockey skates to be about 1 ½ -2 sizes smaller than the shoe size you wear. Ensuring that the hockey skates you choose are the right width and size will allow you to play as freely as possible. Don’t try and overcompensate for a narrow skate by purchasing one that is longer. This will not make up for a skate that doesn’t have the width you need. Make sure you know the right size of your foot, both width and length when you look at the sizing charts. The more careful you are beforehand to ensure that you are purchasing the right fit, the less you will have to worry about shipping the skates back if they don’t fit properly. It can be very tempting to want the same skates that you see your favorite hockey player using or even that a friend of yours has. It is more important for you to choose a hockey skate that has all of the features you are looking for and the size ranges you need. This is what will ensure a great fitting hockey skate, not the famous logo or team mascot on the skate. What most people don’t realize is that the famous skaters that have brand name skates on have had those skates custom made from the manufacturer for endorsing their product. The skates you purchase “off the shelf” will not be the same as the skates they have had custom made for them. Stick to your guns and budget when you are searching for the right hockey skate. It is very easy to get caught up in flashy NHL logos, famous brand names and other aspects of the manufacturing process that have nothing to do with the fit. The main things to concentrate on when it comes to choosing the right hockey skate is the quality of the construction, and the special features that are in place to provide a comfortable experience for the wearer. You also want to ensure a precise fit that does not interfere with the playing experience by being too tight and painful or too big and floppy. The better and more comfortable your hockey skates fit, the more you can concentrate on your game. If you are purchasing a pair of hockey skates for a child, keep in mind that they are still growing. If they play competitively, it is important to get the best quality you can find but keep in mind that they will need a new pair again as soon as they grow. If they are not playing competitively, you can get away with purchasing a less expensive pair. If you are serious about your playing skills and improving your game, then it’s time to get serious about the type of hockey skates you purchase. You will be balancing all of your body weight on very thin blades, so it is important that the skates are as comfortable as possible. Using the information in this buyer’s guide and examining the three top rated hockey skate choices we have reviewed above, you will have all the information you need to make a good decision about the skates you choose. The higher quality the skates are the more features they offer. These features will include things like durability, maximum protection and added passing for ultimate comfort, plenty of support and stiffness to provide stability, and lightweight construction so you can move with speed and agility. Prices for high quality hockey skates will vary, and you don’t want to base your choices solely on price alone. Take all of these factors into consideration and you will purchase a pair of hockey skates that will last you a long time and provide the performance and fit you are looking for. Jonathan manages our Sports & Fitness, Outdoors and Automotive categories. When he's not writing and researching products he enjoys playing Ultimate Frisbee and spending time waxing down his 370z.